Barcelona established a crucial 3-0 win over Manchester United on Tuesday night, to fire themselves straight to the semi-finals of the UEFA Champions League. Goals from Lionel Messi and Philippe Coutinho helped the side to a 4-0 aggregate win over the visitors at Camp Nou. The Blaugrana already had an advantage going into the game owing to a Luke Shaw own goal in the first leg of the fixture. While Messi has been hailed for his genius display during the game, Coutinho has been lauded for his brilliant 25-yard strike past United shot-stopper David de Gea. The former Liverpool star's goal came after a torrid few months at Barcelona, where he has struggled to prove his worth at the team. After capping off Messi's brace, Coutinho was seen celebrating by turning towards the home fans and putting his fingers in his ears. When asked about the celebration, Barcelona manager Ernesto Valverde said, "I honestly didn't see it. I don't know if it meant anything. He would have to explain it to me. What stays with me is the great goal he scored." Speaking of the criticism Coutinho has been subjected to since his arrival at Camp Nou, he said, "There are huge demands at this club. We always have to win and play well. There's a huge media focus and we're all subject to criticism." The celebration has predictably caught the attention of fans who are curious about the reasons behind it. They have since taken to Twitter to address the celebration. 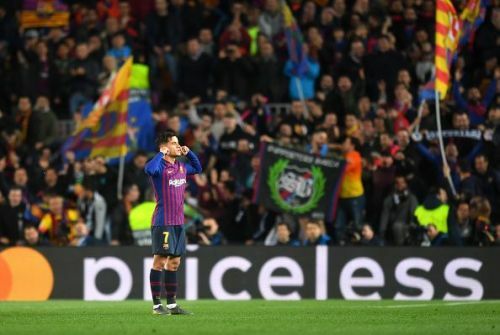 Great celebration by Coutinho, he needs to show more courage and character like that if he wants to stay at Barcelona. Coutinho with the @Memphis celebration, you love to see it. Loved Coutinho's celebration. Hope that goal gives him the confidence he needs. Our fans were giving Coutinho (ex Liverpool) stick all night. He shut us up with a great goal and a gesture to boot. Can’t blame him for that celebration.